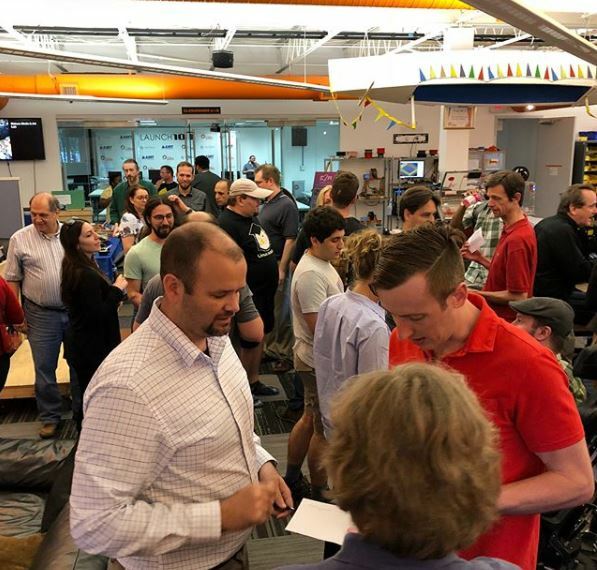 Nova Labs hosted the kickoff for Empower2Make in July with a great turnout. Guests were greeted by Tae Edell sporting the new Empower 2 Make logo designed by Nova Labs member Anthony Pappas. Anthony is an experienced designer and is looking forward to learning more about CAD 3D modeling, laser cutting and CNC at our space. 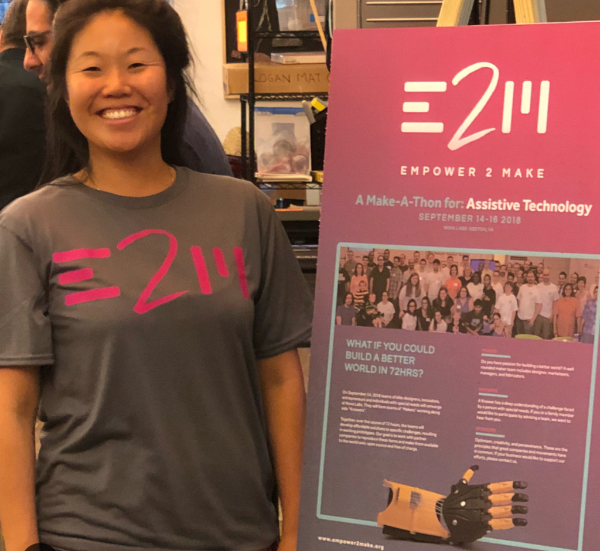 This is the second time around for this signature Nova Labs event — a 72-hour make-a-thon creating assistive technology coming September 14-16, 2018. Thanks to Tech Comm and TC team lead John Hoskins, our new Internet circuit is up and live. Connectivity should be more stable for all users. A woodshop planer upgrade is on the way thanks to a generous anonymous donation, making possible the purchase of a Shellix Helical Cutter Head. It’s board recruiting season, and we’d like to ask everyone in the Nova Labs community to help us fill our positions. Please email or talk to a current member of the board if you’re interested in learning more. 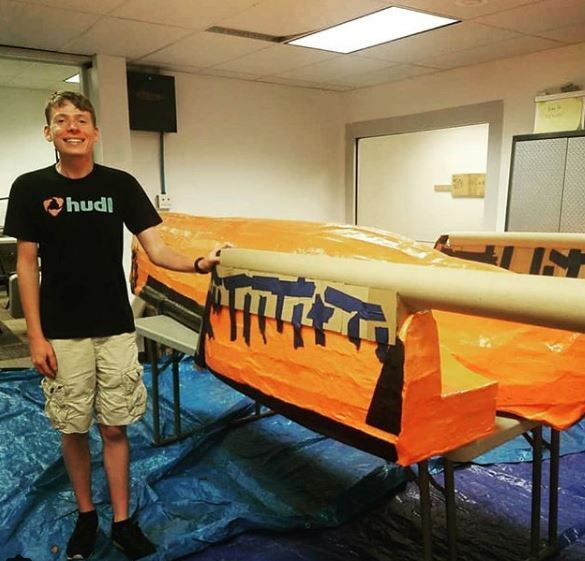 Reston Museum’s 2nd Annual Cardboard Boat Regatta is almost here! On Saturday, August 11th, the Reston Museum will host the second annual Cardboard Boat Regatta on Lake Anne. Last year was a resounding success, with 20 boats and hundreds of spectators flocking to Lake Anne to watch! On the day of the event, Nova Labs will once again be running the Dry Dock Tent, where volunteers will have extra cardboard and duct tape to assist teams with last minute boat fixes and to answer any questions about Nova Labs or Maker Faire. Contact Jeanne Marshall if you’d like to hang out and help! The 72 hour Make-A-Thon to develop assistive technology takes place September 14-16th. The kickoff party in July brought a great turnout! For more information on Empower2make check out our website Empower2make.org or email info@empower2make.org. 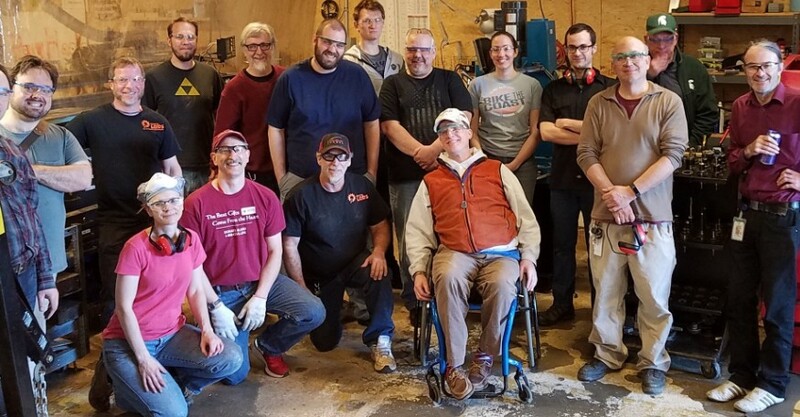 It’s been a bit over a year of real growth in the metal shop, thanks to the leadership of a core team of volunteers and a growing interest in the discipline. Led in the earlier days by Mike Hoyer and Mike Hogarty, the team has expanded and refined many elements of the program. Since then, the shop has developed a true makerspace identity, with a broadening range of activity clearly on an upward trend. Metal Monday has become a well-established part of the Nova Labs program, with visitors and members (new and long-term, alike) stopping in for technical assistance, tool use, and simple camaraderie. We have a good array of new equipment (MIG and TIG welders, metal shear, box and pan brake, horizontal and vertical bandsaws), improved tool storage, and a healthy inventory of materials and supplies. The blacksmithing program is steadily growing under Bill’s leadership, with many others backing him up. Lead host Chip Levy took over the sheet metal program when Phil Tacas moved to the west coast. 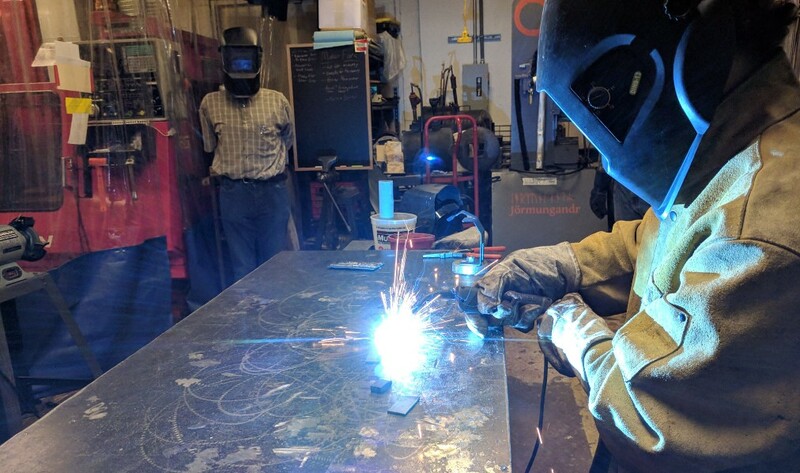 Mike Youmans stepped in to lead MIG welding instruction and as sheet metal backup (and hosting) when he can break free from his robotics mentoring. Doug Newton teaches milling and metal lathe and welding, and Siobhan Williams and Steve Malloy have refined and stepped up the pace of Yellow-level instruction. We have an improved physical layout and better lighting, a cadre of skilled and active volunteer stewards and instructors with can-do attitudes and willingness to share; an expanded class schedule, and an effective and well-used communications mechanism (thanks in no small measure to our member colleagues in techcomm, facilities, operations, events, and everyone else). We’ve more than doubled the metalshop cohort list and are adding people every week. We’re working on regularizing machine and shop maintenance systems, bringing greater rigor to our class and instructional structures, and growing our volunteer leadership and involved makers lists. Members, please look out for each other this August (and beyond!). Remember, minors must be signed-off on a tool AND be supervised by a qualified adult. Parents and guardians should also be supervising. What does that mean in practice? It means if you see a minor using a red or yellow tool, ask 1) if he or she is the certified on the tool, 2) who is his or her supervising adult, and 3) determine whether or not the supervising adult is qualified to supervise that tool. Do not let the minor operate the tool before you determine he or she is allowed to use it. Be courteous, firm, and respectful. Safety is everyone’s responsibility. If you are working outside for long hours this summer, get water! Stay hydrated and make sure to get some electrolytes in you, too!